Aft stem glued on and ready for skeg. 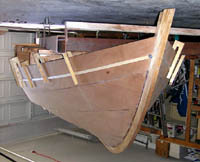 Note that the "deadwood" section is part of the aft stem lamination. Both outer stems are yellow pine. The spiled skeg fit nicely. Very little force was needed to hold it in place and close the gap during gluing. 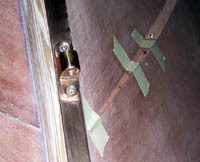 No temporary fasteners were used. Skeg and aft stem are rough cut for gluing and will be faired later. Bilge rubbing strips are dry fit. A notch in the rubbing strip accepts the chainplate. 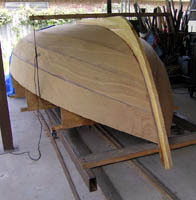 A notched gunwale rubbing stripped will go on next. A chainplate pad will be attached to the inside of the hull. 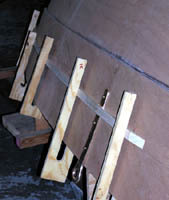 The upper ends of the chainplate pads will act as spacers in the open gunwales. Ron Davies taught me this trick! 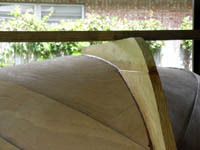 Gunwale rubbing strip has "L" cross section for covering plywood edge. Keelband is 1" x 1/8" silicone bronze, attached with #10 bronze screws. 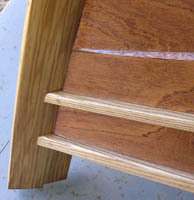 Wooden fillets have a triangular cross section, softening the step from one plank to the next and allowing easier bending along the planks' curvature. 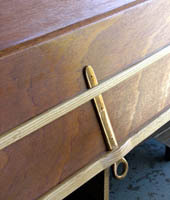 Small nails are used to tack wooden fillets in place. 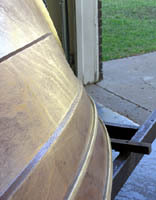 CPES applied to outer hull--last step before turning over. Wood grain and color now showing. 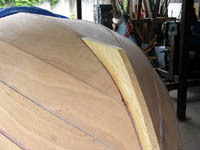 Geometry of triangular wooden fillet is evident here. 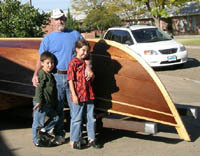 The colors of the yellow pine stem, ash rubbing strips, and sapele planks are enhanced after one coat of CPES.